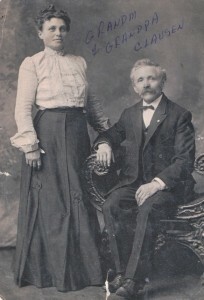 Peter and Marie Clausen were both born in Denmark. He was very proud of his family of 13 children and were featured in a newspaper story called “A Big and Happy Family in Peter Clausen’s Home.” On August 15, 1910, the day that would have been Peter and Marie’s 29th wedding anniversary, he committed suicide next to a small tree that he had planted on his wife’s grave whom he wrote in a note to the eldest child he was going to join. They are buried in Lot 24, Block E of Minneapolis Pioneers and Soldiers Cemetery. On April 1, 1904, the Minneapolis Journal ran a human-interest story under the headline, “A Big and Happy Family in Peter Clausen’s Home.” They were, according to the reporter, “probably the most interesting family in the city of Minneapolis.” What made them interesting is that Peter and his wife, Marie, had 13 children, ranging in age from 21 years to seven weeks old. The reporter made it a point to comment about the family’s good health noting that none of the children had ever been seriously ill although they had had their share of the usual childhood illnesses. Five months later that changed. Sylvia, the baby, died in September 1904, at the age of seven months. The following year Marie (sometimes called Mary or Mette) gave birth to their fourteenth child; the baby only lived for three days. On May 11, 1910, six years after the Journal ran its story, Marie Clausen died from cancer of the uterus; she was 48 years old. Peter became deeply depressed. He quit working and, according to one newspaper account, “had been to Anoka for three months,” an apparent reference to the Anoka State Hospital, where it is likely that he was treated for depression. They were unable to help him. On August 15, 1910, the day that would have been Peter and Marie’s 29th wedding anniversary, he committed suicide next to a small tree that he had planted on his wife’s grave. He left a note addressed to their oldest daughter saying that he was in poor health and that he wanted to join his wife. He is buried next to her in Lot 24, Block E of Minneapolis Pioneers and Soldiers Cemetery. Another daughter, May, died from tuberculosis on April 24, 1916. The rest of the children appeared to fare well, most of them living until the 1960s and 70s.